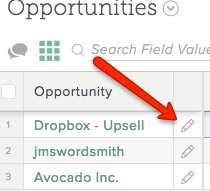 You use Account Lists in SalesforceIQ to track a lead, opportunity, and so on throughout every stage of the process. However, sometimes you may have more than one deal or opportunity associated with an Account. When you add a object such as a lead or opportunity to an Account List, the Account name associated with that object displays by default. You can change the display name to indicate that the object is associated with a specific deal or opportunity for that Account. Note: If you want to associate multiple opportunities for parent and child companies, follow these steps instead. When you add the List object, you are prompted to either search for the Account associated with it or to create a new Account. Enter the company name and select the Account from the entries that appear. After you select the account, edit the name to reflect the opportunity. The icon appears next to the List object name in the Grid view. Click to edit the object name displayed. The display name now shows that this is a unique opportunity within this Account. Each Account List object has specific Points of Contact, which you can update using the Add Contacts option. 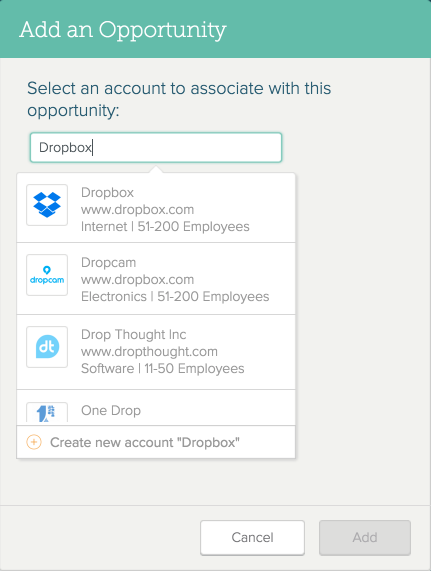 SalesforceIQ provides a list of suggested Contacts for you to choose from, making it that much easier to create multiple opportunities. You can also go to the Account page, where you can see every List this Account exists on—including the status, owner, and Contacts specific to the List object—as well as view all the Contacts on the Account. 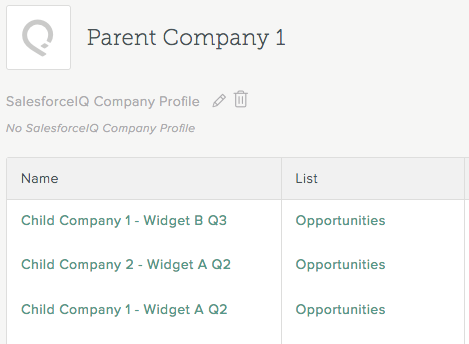 If you’re trying to associate multiple opportunities for parent and child companies, we recommend creating the parent company as an Account and adding all the associated child companies or brands as opportunities on your List. Note: Because you’re attributing the opportunity to the parent Account, each opportunity will not have its own child company Account Profile. Add an Account using the parent company information. When you create a new opportunity for the child company, make sure to attribute the opportunity to the parent Account. 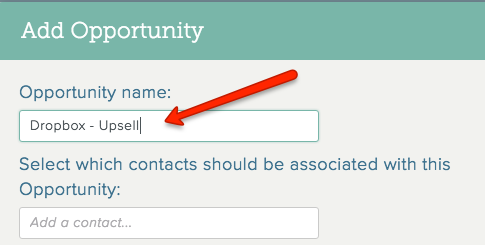 Update the Contacts for your opportunity to include only the people you’re communicating with for that specific opportunity.